Contoh Soal Conditional Sentences Type 1, 2, 3 - On the above conversation between Iris and Cisco, we are not yet sure whether Cisco will get the ticket to Bali or not. The probability for this situation is 50:50. Cisco may or may not get the ticket. Therefore, in the above case, Cisco answered, “I will be there if I get the flight ticket”. This condition is called present real conditional sentence or Conditional Sentence Type 1. Learn about the pattern of Conditional type 1 from the following table. 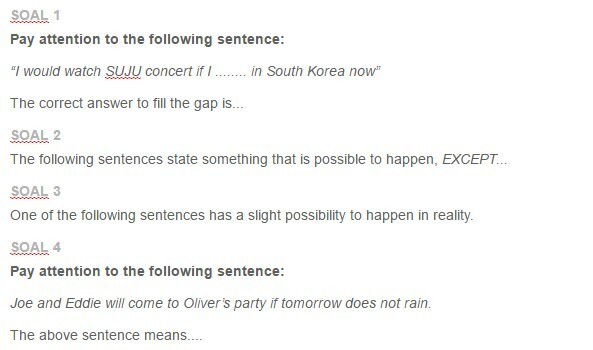 One of the following sentences has a slight possibility to happen in reality. Joe and Eddie will come to Oliver’s party if tomorrow does not rain. Allen : How was the conference? Felice : It was boring. The conference would have been more interesting if the committee had chosen Prof. Wells as the speaker. I woke up late yesterday because I stayed up late and did not sleep well the night before yesterday. Due to many troubles, I also came late to the airport and missed the flight to London yesterday’s morning. I have rescheduled the flight. I will fly to London tomorrow’s afternoon. Decide the probability of the sentence, the type of conditional sentence used, and the meaning of the sentence. The type of conditional sentence is : Past unreal conditional sentence. Meaning : I did not left the key last night. If I were the President, I would give scholarships for potential students.